SAN FRANCISCO, November 7, 2009, A&J Mechanical Servies LLC has been selected for the 2009 Best of Business Award in the Mechanical contractor category by the Small Business Commerce Association (SBCA). 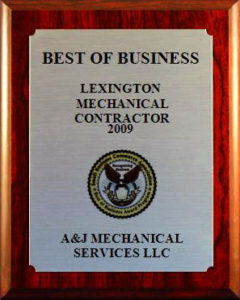 The Small Business Commerce Association (SBCA) is pleased to announce that A&J Mechanical Services LLC has been selected for the 2009 Best of Business Award in the Mechanical contractor category. Small Business Commerce Association (SBCA) is a San Francisco based organization. The SBCA is a private sector entity that aims to provide tactical guidance with many day to day issues that small business owners face. In addition to our main goal of providing a central repository of small business operational advice; we use consumer feedback to identify companies that exemplify what makes small business a viatal part of the American economy.